The sciatic nerve is located in the back of the leg. It supplies the muscles of the back of the knee and lower leg. 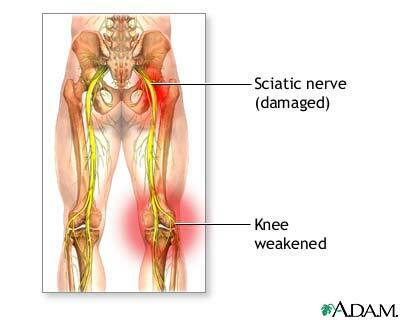 The sciatic nerve also provides sensation to the back of the thigh, part of the lower leg, and the sole of the foot. Partial damage to the nerve may demonstrate weakness of knee flexion (bending), weakness of foot movements, difficulty bending the foot inward (inversion), or bending the foot down (plantar flexion). A person's reflexes may be abnormal, with weak or absent ankle-jerk reflex. Several different tests can be performed to find the cause of sciatic nerve dysfunction.